Considering an Ebb & Flow System? Take a look at our Ebb & Flow Packages or shop individual components to create your own system if you are the DIY type. All living things need water to survive and as simple as water seems, it can be overwhelming at times to effectively manage your water quality and quantity. Filtering water to remove harmful chemicals and minerals is a good idea for both hydroponic and soil growing. Read our blog to learn more. What is a flood table? Hydroponic flood tables, also referred to as grow trays, are a means for holding plants in a hydroponic system. These work in tandem with a grow tray stand or rolling bench, with the hydroponic reservoir underneath. A water pump feeds nutrients from the reservoir into the flood table, which will slowly drain back into the reservoir. See ebb and flow systems for more information on how these flood tables are used. When selecting a flood table, it is important to consider the dimensions of your stand or rolling bench. 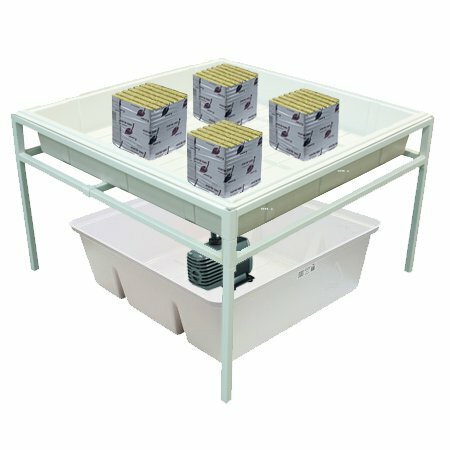 Grow trays and flood tables list inside dimensions (ID) and outside dimensions (OD). The outside dimensions are important for determining whether or not a particular tray will fit in a stand. The inside dimensions are for determining how many plants you can really fit inside the tray or flood table. Flood tables come in a wide range of sizes, so it is easy to outfit your grow room efficiently. Here at Hydrobuilder we carry sizes ranging from 1' x 4' all the way to 6.5' x 5', with everything in between. Most trays come in white, black, or gray. If you are unsure which flood table will fit your stand, let our experienced growers help you! Give us a call at 888-815-9763! Grow trays typically come in one size such as the popular 2' x 4', whereas flood tables allow for more customization. You can purchase sections or pieces of flood tables and create the most ideal grow room possible! Attempting to outfit a large commercial operation with standard flood tables and stands will be inefficient, and if you want to make the most out of your space, we recommend creating a custom floor plan for your hydroponic systems. At Hydrobuilder, we work with industry cultivation professionals on a daily basis to help streamline the growing process form start to finish. Our inside connections with leading hydroponic manufacturers allow us to configure custom commercial rolling bench systems to fit your exact needs. Outfitting your grow facility with commercial grade rolling benches allows you to smoothly roll your tables from side to side eliminating the need for multiple aisles in your growing space. Eliminating these unnecessary aisles turns valuable wasted space into usable production space. If you are looking to create a custom flood table or rolling benches for your hydroponic warehouse, grow room, or greenhouse, sign up for a commercial account today! With a commercial account you will get a dedicated sales rep, custom wholesale pricing, cultivation design assistance and much more! If you want to learn more about flood tables, stands, and rolling benches, check out our full breakdown in our learning center! As always, give us a call at 888-815-9763 with any questions! Botanicare Rack Black Tray, 2 ft. x 4 ft.